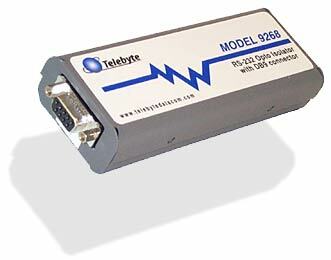 Ensure clean data transmission and reception between two devices by installing Telebyte Model 9268 Opto Isolation Module with DB9 Connectors. For applications ranging from testing laboratories to factory floors, isolation is a critical component in data communications environments. Minimize the occurrence of data errors, voltage spikes and system faults while providing full duplex, optically isolated signal paths for both TD and RD, and a control signal pair selected by internal jumpers (CTS, RTS, DCD, DTR). The Model 9268 protects against ground loops between devices that use different power sources, generate dissimilar ground currents or produce noisy signals for data rates up to 115 KBPS. Equipped with a standard DB9 interface for direct connection to the latest computer hardware, the Model 9268 is designed to protect against these problems in a smaller form factor than 25-pin serial connections. Equipment and personnel are at risk when linked devices operating at different ground voltage levels attempt to bring each other into equilibrium. The Model 9268 provides a barrier between ground points and suppresses the generation of ground currents. In addition to opto isolation up to 2500 VAC, the Model 9268 incorporates two sets of micro power DC-to-DC converters to generate the necessary operating voltages, one for each port.